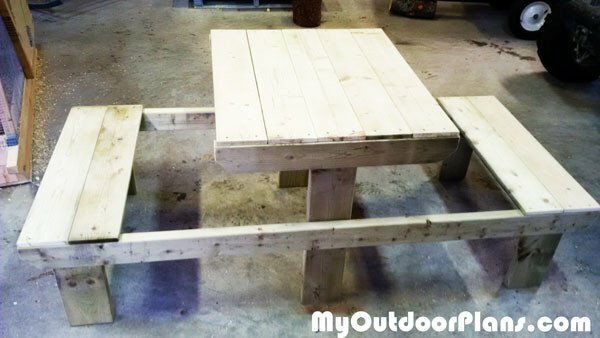 This was a great weekend project, I used pressure treated lumber so the total cost was about $60. The only change I think I would make would be to use slightly thicker boards for the top and seat slats, maybe 5/4 X 6 instead of 1 X 6. You can construct the entire thing with one person in a few hours except you may want assistance attaching the side rails to make sure everything is fair and square. The only power tools I used were my mitre saw and a drill. This will go great on our back patio. I’m not sure if I am going to stain this yet or not, I’ll figure that out once spring gets here! regarding two person picnic plans. After doing the math on material list, the materials list does not match the plans The Buying Guide is short on the 2 x 6 boards. Other than that it is a great plan and I enjoyed building it. Nice catch. I will make the modifications to the buy list. I would love to see how your project turned out!